As a member of the Dutchess County Regional Chamber of Commerce we want to highlight your business. 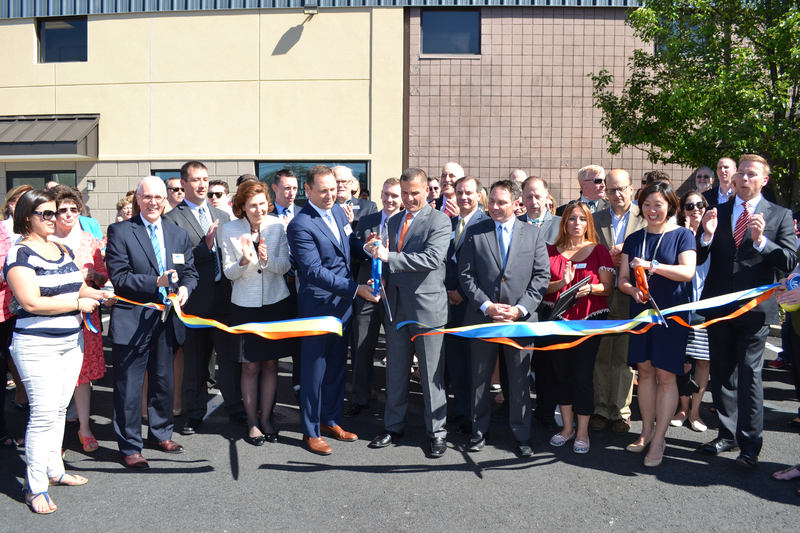 There is nothing more memorable and iconic than a custom tailored ribbon cutting ceremony to commemorate a grand opening, milestone anniversary, or new location. The date and location of your ribbon cutting is highlighted in our monthly newsletter, The Bottom Line, during the month of your event. This newsletter is distributed to our members as well as inserted in the Poughkeepsie Journal with a readership of more than 50,000 people. A ribbon cutting should be scheduled at least six weeks in advance to receive the maximum amount of media exposure. While it is possible to schedule the event in a shorter timeframe, the amount of exposure received for the ribbon cutting will be limited. The ribbon cutting is listed on our community calendar in our website, www.dcrcoc.org, as well as the Chamber events calendar. The ribbon cutting is listed on the mass email to our members on the week before the event. The ribbon cutting is promoted on our radio shows prior to the event. A list of all ribbon cuttings is distributed to all guests of the Contact Breakfast for the present month. An updated list of scheduled ribbon cuttings is included in the new member packets each month. * If you wish to have a certain number of people at your ribbon cutting in addition to the above, we can also design, print and mail a postcard invitation to a selected group of members. We will also take the RSVPs and make any necessary follow-up calls to insure your requested attendance at your event. This type of ribbon cutting is available at a special rate. There are also media packages available for your ribbon cutting if you are interested. The decision to hold a ribbon cutting is at the discretion of the Chamber and all ribbon cuttings are subject to review, cancellation, or rescheduling for any reason. We strongly advise against hosting ribbon cuttings during the winter months due to inclement weather. We do not reschedule ribbon cuttings due to inclement weather or for any other reason during the same calendar year. Status updates will be posted on the Chamber’s website and Facebook pages accordingly. Any ribbon cuttings scheduled during the winter months may be canceled due to weather conditions and is at the sole discretion of the Chamber. The Chamber strongly urges our membership to avoid hosting a ribbon cutting celebration during the winter months due the possibility of inclement weather. However, if you wish to proceed with your ribbon cutting during this time-frame, you will be risking the ability to notify your attendees of such cancellation and rescheduling. Also keep in mind, historically, attendance for any event held during the winter months may be lightly attended due to outdoor conditions – regardless of indoor location. A cancellation of a ribbon cutting due to weather, or otherwise, will result in an inability to notify the public of such a cancellation. For six weeks leading up to the event, the Chamber offers significant advance promotion of ribbon cuttings on the radio, newspaper, newsletter, social media, flyers, mailers, website and other. The Chamber does not have the ability to notify all individuals who plan to attend, hence the Chamber cannot be responsible for notifying its membership with a specific notification, in any form, of such cancellation or rescheduling. Due to the aforementioned, we strongly urge against scheduling events during the winter months. For promotional purposes, the Chamber requires a minimum of six weeks advance notification to schedule a ribbon cutting in order to receive the proper marketing and advance promotion. A special notification cannot be accommodated. PLEASE NOTE: All ribbon cutting requests must be for a milestone celebration of significance. A new logo, sign or driveway does not a qualify. You must be a member of the Chamber. New members will be charged a fee for a ribbon cutting, which will be deducted from the membership renewal the next year. We encourage you to attend one or two ribbon cuttings prior to organizing your own. We strongly recommend you allow a minimum of six weeks for the planning of your event so the Chamber can market it properly. Ribbon cuttings are scheduled during the business day, Monday-Friday, at either 12 or 4 PM. We encourage you to utilize fellow Chamber members to cater refreshments for attendees. Click here to view the Restaurants & Caterers in our Membership Directory. We strongly encourage you to invite your customers, family and friends. Once you complete and submit the registration form, a representative from the Chamber staff will contact you to assist you in organizing your event.